I’m a little under the weather this week, it seems. 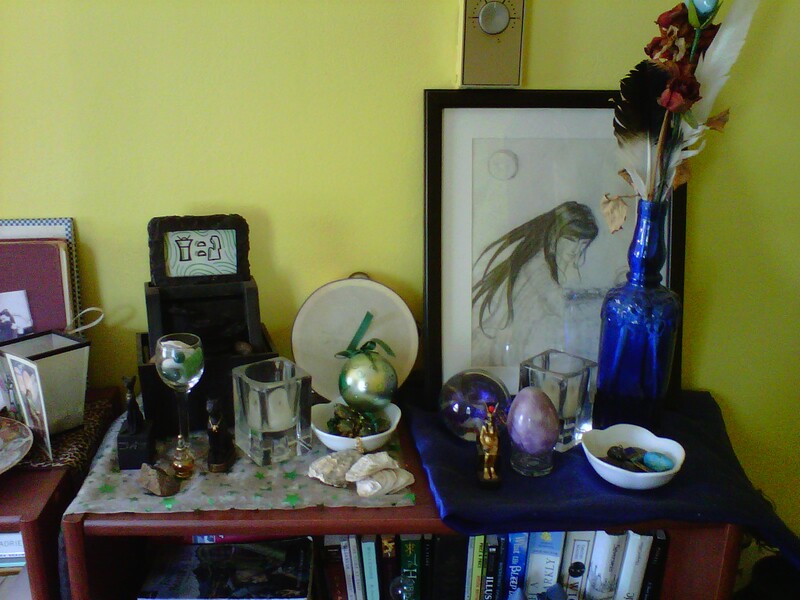 So instead of trying to kick my brain into gear for an actual post, have a tour of the shrines in my home. 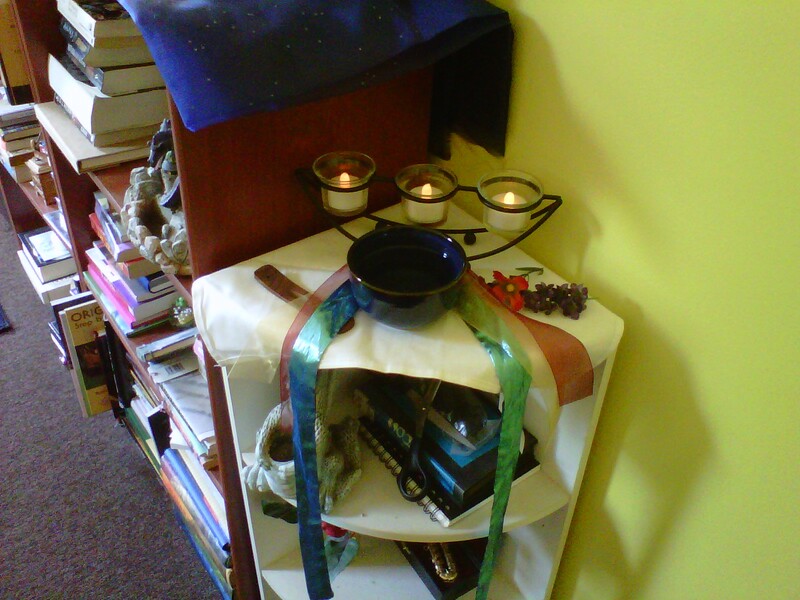 I just undertook a huge cleaning of my room, which included tidying the shrines in my life. Have a look! This is my Akhu shrine. It’s full of things that remind me of my ancestors, by blood, by kinship or by faith. There are little pyramids and Egyptian style images for the people of Kemet, whose gods I worship; there is a hymnal, some prayer cards and a rosary for my Catholic ancestors; there are a few pictures of my ancestors, tucked in there in places, and little things that the people who I knew would like – a miniature clarinet, flower shaped candles, stained glass hummingbird, a doll’s tea set. This is a tiny shrine to Djehuty, kind of. This sits next to my computer desk, as evidenced by the external hard drive and the speaker. I’m not sure it’s a shrine to Djehuty as much as it is a shrine to wisdom and prosperity in a myriad of forms. It’s got an owl, a little toy Djehuty, a fountain pen and a few other things that seemed appropriate at the time. Most of the things here were given to me as gifts. 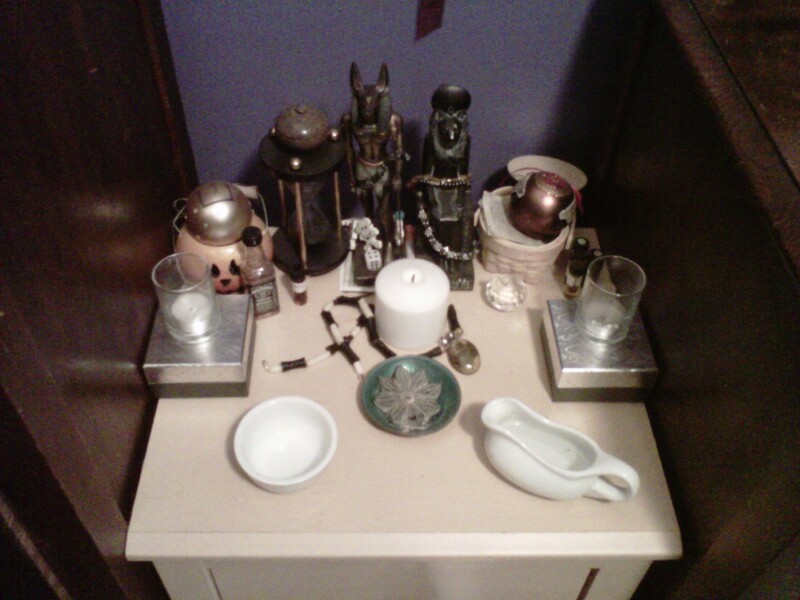 This is a very small shrine to Khonsu, and kind of also Mut and Amun-Ra. A few years ago, Khonsu demanded my attention. He insisted I add Him to my shrine, and listen to Him – obviously I listened. 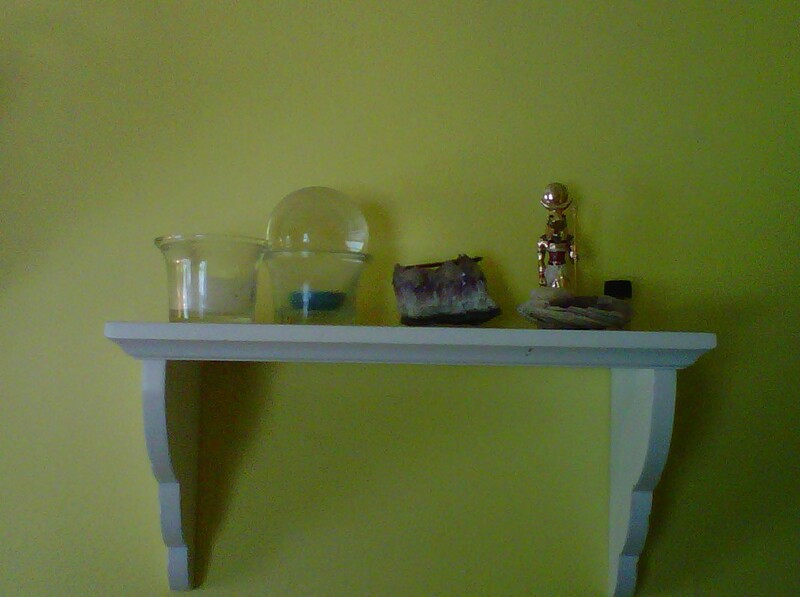 On His shrine are some white beads, a clear glass ball, a nutty essential oil perfume, and some white shells. 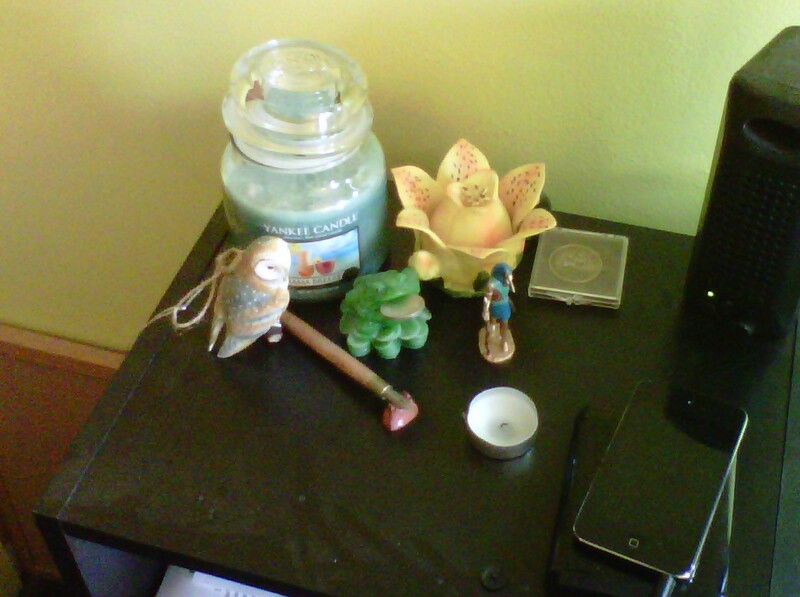 This is my shrine for the year of Zep Tepi. I have a small electric tea-light for each season of the year, and ribbons for each of the gods assigned to each season: Ra, Mut, and Mehet-Weret. The blue bowl is full of water, for the Nun, the potential from which Zep Tepi occurred. This shrine is for my Beloveds, Bast and Nut. Bast is on the right, and Nut is on the left. Bast’s shrine has offerings of a small fountain, a tambourine, a christmas ornament, seashells, sea glass, smooth stones, perfume and jewelry. Nut’s shrine has offerings of feathers and dried flowers, a milky-way paperweight, a stone egg, blue stones and coins, and a drawing by Shemsu Kefetmisenu. The image of Nut I am using is not specifically Her, but it is the representation She said I should use. Last but not least is my personal shrine, my Senut shrine. 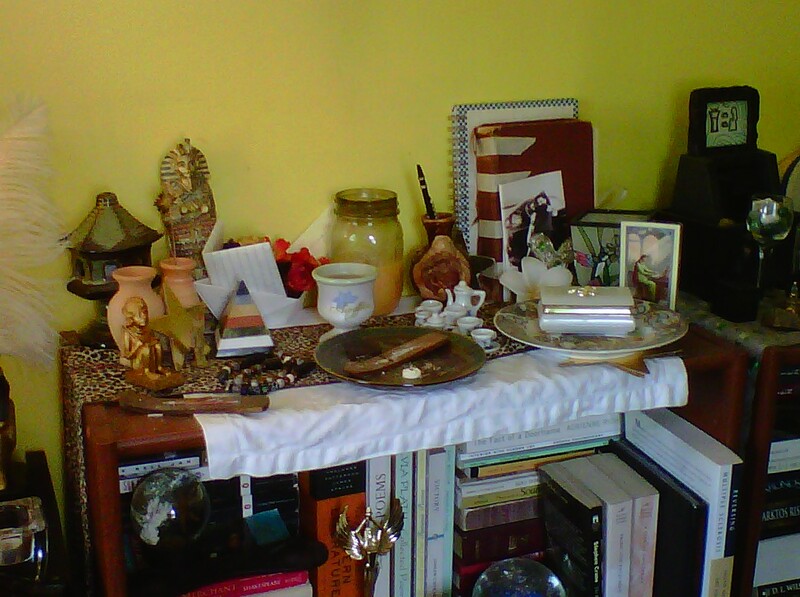 Here are offerings to my two Parents, Wepwawet and Sekhmet-Mut. They have two christmas ornaments, their shenu (in the silver boxes under candles), my Shemsu-Ankh scarab, an hourglass, a stone box full of coins, perfumes, a glass prism, tea leaves, rose quartz, jewelry, obsidian, arrowheads, and more things I can’t even begin to count. Wepwawet wears a snowflake obsidian bracelet and a wooden skull necklace; Sekhmet-Mut wears an amber bracelet and a hematite/rose quartz necklace. Next Post Episode 24: Reconstructionism vs. Revivalism vs. ??? Thanks for sharing these. I love seeing people’s shrine photos. It IS like a glimpse of their relationship. Yours are beautiful! It’s really interesting to see your shrines! Maybe it’s that the world is so inundated with crucifixes and the like (or maybe it’s the difference between their symbology and the behaviors of a lot of the people who hang them) that I’ve become somewhat jaded to them, but it always really piques my interest to see different physical forms of worship, especially in the home. Of course because everything is foreign to me, I’m insanely curious, but I’ll limit myself to one question, haha: you’re allowed to use electric tealights? I don’t know that I’ve ever really seen any used in a religious context before (outside Mystic Realms, which hardly counts XD), though I could be wrong. I mean, for practicality’s and safety’s sakes, it makes sense, especially if it’s supposed to be constantly or near-constantly lit. But for all of my religious experiences (mostly Roman Catholic, though I have attended other catholic denominations’ services, and two mostly-non-denominational weddings), it’s been conveyed fire = fire, fancy flashlight != fire, etc. I really don’t mind answering questions – feel free to ask about anything that sparks your curiosity! There’s not a lot of hard and fast rules about the candles. As far as being ‘allowed’, it’s kind of up to personal needs and comfort. I only really analyzed why I would or wouldn’t choose electric tealights over real candles in answering your comment – so bear with me if this is a little hard to follow. It comes down to safety and purpose, I think. If I’m doing something that says “light a candle” and it’s made clear that I’m meant to use fire (many of the rituals I do specifically say “flame”), then I’m going to find a place that is fire-safe and go from there. Sometimes what I’m doing just requires light, though – like marking the seasons off (like in the Zep Tepi altar) or keeping a light lit throughout the night for the Winter solstice. If that’s the case, I’m not as particular. The space I’m using isn’t really practical for a fire either – it’s kind of under a cloth. So since it wasn’t really imperative that it was flame, I went with electric tealights. I guess it’s more of a space to encourage contemplation and reflection rather than for ritual use, which makes a big difference.